A windy forecast limited the attendance in Dallas with RS Aeros grouped with the mixed Portsmouth fleet. Winds on Saturday were gusty 12-20mph early increasing to steady 18 gusting to 25mph. Double WL courses were set up. Races were 50-60 minutes for the first finishers,Longer than normal. Held my own with tight racing between 3 of the Flying Scots finishing 3rd in the first race. Second race was much of the same, with all the fleets splitting sides of the course. The left side had considerably larger waves with steadier wind. The right side was flatter but shiftier under the shoreline. Had to be on your toes due to the large shifts...some auto tacking burst caught some by surprise. I tended to fight the waves left with the top guys and work back to the right late capitalizing on shifts at the top. With the wind up and down, keeping up with the Scots was challenging. Gear changing was critical. The Scot is rated faster than the 7 rig, so being near them or ahead was my goal. Third and fourth race of the day was awesome as the wind cranked. The Sunfish sailed by the talented Gill Greenwood from Oklahoma played the right to avoid the hull crashing steep waves on the left side of the course. It worked for him. He won the two final races on corrected time. Sunday we were treated with winds 22-24mph gusting to high 20's and occasionally over 30. The fleet dwindled down to only half the boats going out. I led the fleet in the first race with a huge lead. Flying Scots bailed at the first mark due to "too much" for them to handle. I was at least a half mile in front of the 420. Easy win. 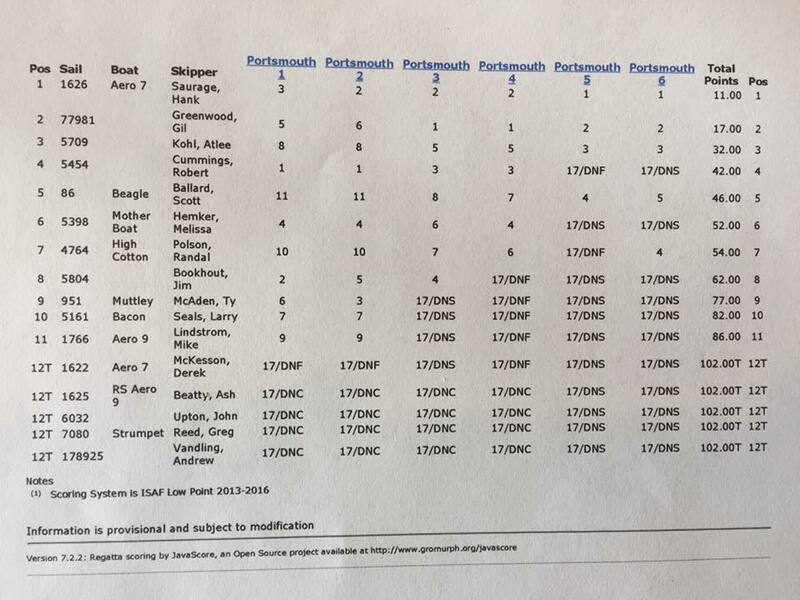 Last race was reduced to a single WL to close the regatta. Ash developed Bursitis in his elbow that got worse Saturday and Sunday, to a point he couldn't move his arm. Mike and Derek gave it a go in the early races and found they needed more time figuring the boat out in fairer conditions. We were able to get video (I haven't seen it yet) showing my technique and theirs. We discussed what was seen in the video and I gave them some good tips on setup and boat handling in those conditions. I am sure they will be practicing between now and ‘Wurstfest’ at Canyon Lake on November 5/6th with the knowledge they possess now. They are both really good sailors and should be at the top of the fleet come November. We look forward to an awesome regatta with 14 Aero's now registered/confirmed for the event.